A roof is one of the most important parts of a house. If your roof is broken or damaged, the comfort of your home will be compromised. The roof is made to keep the house free from outside elements. A damaged roof may not be sturdy enough to continue to protect your home from these elements. That is why it is so important to make sure that you properly maintain your roof. In addition to make sure that your house is protected, it is beneficial to choose a roofing material that is meant for the climate of your home. Depending on the location of your house, some roofing materials will be more beneficial than others. The best way to make sure that you choose the right roofing material to protect your house is to know which roofing materials are meant for which climates. If you live in a dryer climate and need a new roof, you will want to look for a material that can protect your house from the heat, as well as the wind. Some roofing materials that have these characteristics are clay tiles, as well as metal roofing. Clay tiles are a great option for dry hot climates. Not only are they extremely durable, but they also have a good lifespan. That means that by replacing your roof with clay tiles, you will most likely never have to replace your roof again. In addition clay tiles will save you money in the long run on energy bills due to the amount of sun rays they can reflect. Clay tile is a great choice if you live in a dry climate and want a roof that will keep your house cool during the heat. Another great option for a house in a dry climate is metal roofing. A metal roof is great for a dry climate because it is wind resistant and keeps the heat out. Even though clay and metal are completely different materials, metal roofing is also known to reflect the sun. By reflecting the sun, metal roofing will keep your house cooler so that you will save money on your monthly electric bill. 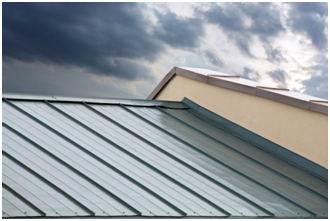 Metal roofing is a great option if you are looking for a roof that will protect your home from wind and heat. If you live in a wet climate you want to make sure that your roof is meant to keep your house dry. A few roofing materials that are known to work extremely well in wet climates are rubber roofing and slate. Rubber roofing is a newer option, but it is becoming more and more popular. Not only is it affordable, but it can be placed on top of your existing roof. Rubber is durable and does a great job at keeping the water out of your house. If you know that your roof is damaged or needs to be replaced, but you don’t have a huge budget, rubber is a great option for you. While it is one of the most expensive roofing options, slate will continue to protect your home for centuries to come. It has the longest life span out of any roofing materials. In addition to its lifespan, slate is extremely durable and comes in different colors providing a unique look for your home. If you have a good size budget and want the best material you can get for a wet climate, slate will not disappoint you. There are so many different roofing materials. Finding a material that fits best with the climate of your house will help you narrow down the roofing option that is best for you. Call a trusted roofing contractor to discuss your roofing options. The roof is the one thing on your home that needs to be in good condition for the safety of your house. Make sure that your roof continues to provide the proper protection that your home needs.